Two years ago, our family moved back to the rolling hills of southwest Virginia. My husband had been raised here, and even though we had literally traveled the world, he never could quite escape them. I grew up 300 miles north but have found that there is something very familiar about this area. The small communities. The strong sense of place. And family roots that run as deep as the white oaks’. Still, I’ve had a lot to learn in the last two years, to learn the stories that make this place what it is. Most recently, I’ve been learning about the unique price that southwest Virginia paid during World War II. January, 1945. U.S. troops battle for the liberation of the Philippines. As they make their labored advance, the occupying Japanese army burns alive 150 American prisoners of war at a camp on the island of Palawan. Fearing a similar atrocity, Lieutenant General Walter Krueger assigns Lieutenant Colonel Henry Mucci and his Sixth Ranger Battalion the mission of rescuing the allied prisoners held at Cabanatuan. On January 30, Mucci moved. 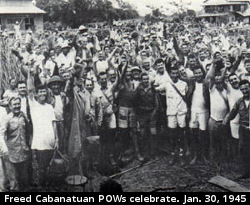 127 Army Rangers under the direct command of Captain Robert Prince, supported by 200 Filipino guerrillas, led a daring raid upon the compound at Cabanatuan. In a stunning tactical victory, Prince’s unit killed 523 Japanese troops—losing only four men in the process—and freed 511 frail, starving and disease-ridden prisoners of war. At 8:15 pm, Captain Prince shot a flare into the night sky signaling that the improbable mission of liberation was complete. Yet as that victorious flare lit up the night sky, the task was long from finished. You do not free 511 infirm prisoners behind enemy lines and say, “Gentlemen, it’s been a pleasure; good luck to you all,” and walk away. Through the remainder of that night, the soldiers who liberated their comrades escorted them to safety through many dangers, toils and snares. The mission was not complete the moment the prisoners were freed. It was complete when they were delivered safely home. It is this kind of complete deliverance the Bible promises the followers of Jesus Christ. By His death in the sinner’s place, and by His triumphant resurrection from the dead, Jesus stormed the gates of hell, liberating those who turn from their sin to trust in His rescue. This cosmic victory over sin and death accomplished the most glorious liberation in history. "The price for the Overlord invasion on June 6 was 4,413 Allied dead, of whom 2,499 were Americans."